Daystar PA60043 Body Lift Kit Fits 00-02 Dakota. Body Lift Kit; 3 in. 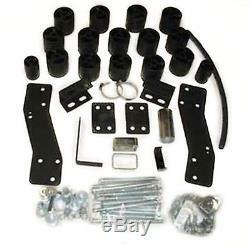 Steering Extension; Front/Rear Bumper Brackets; Blocks; All Required Hardware. WARNING CA Proposition 65: Yes. Other Parts Required For A Complete Kit. Grade 5 Zinc Plated Hardware. High Grade Reinforced Nylon Lift Blocks. Custom Machined Splined Steering Shaft Extensions. State Of The Art CNC Equipment. Performance Accessories 3-inch Body Lift Kit raises the vehicle for adding larger diameter tires, without altering the factory suspension system and OE ride characteristics. The kit includes high pressure fiberglass reinforced nylon lift blocks, 3/16 inch thick laser cut and powder coated front bumper relocation brackets, a CNC machined and zinc plated steering extension, high strength hardware, and extension brackets. A set of urethane wheel-well extensions (Gap Guards PN-6617) are available separately, and are used to conceal any gaps between the body and frame in the wheel wells. For the rear bumper area a one piece rear bumper urethane Gap-Guard is available separately (Rear Bumper Gap Guard PN-6620) and is used to conceal the gap between the tailgate and the rear bumper. This system can be installed in 7 to 8 hours and comes complete with everything necessary for installation. Benefits: Provides 3-inches of lift without modifying existing suspension components. Allows use of larger diameter tires and factory rims for improved ground clearance. DOES NOT alter the OEM suspension geometry or factory stability control parameters. Maintains the factory smooth ride. Keeps the trucks center of gravity lower than a comparable suspension lift. Features: Fiberglass reinforced nylon body blocks CNC machined & zinc plated steering extension Laser cut and powder coated relocation brackets Laser cut and zinc plated fittings and brackets High strength hardware included Made in the U. Since 1977, Daystar has been designing, producing, and distributing precision plastic parts for 4WD trucks, motocross bikes, cars and mountain bikes. Their line of products is available for use on a long list of production vehicles including GM, Dodge, Ram, Ford, GMC, Jeep, and Toyota. Daystar lift and leveling kits are designed to improve ride comfort, increase ground clearance, and allow vehicle owners to upgrade to larger wheels and tires for 4WD and off-road trucks and SUVs. Whether you need a lift-kit for your truck to make it stand out or just want to improve or restore a level, comfortable ride in you truck, Daystar has a variety of products to get the job done. Daystar also offers a variety of other upgrade accessories including shackles, hood accessories such as hood vents, hood wranglers, dash panels, and lubricants. For this reason, we usually cannot cancel an order once it's placed. Compatibility chart and application-specific wording in this listing are based specifically for USA market vehicles. Fitment is not guaranteed on international vehicles, as many manufacturers use region-specific options. New items must be in original packaging(including plastic wrapped items), uninstalled, and in factory new condition. We only sell factory new parts, no exceptions. Stuff happens, but when it does, we'll take care of you. The item "Daystar PA60043 Body Lift Kit Fits 2000-2002 Dodge Dakota Easy to Install" is in sale since Tuesday, November 13, 2018. This item is in the category "eBay Motors\Parts & Accessories\Car & Truck Parts\Suspension & Steering\Lift Kits & Parts". The seller is "21-motorsports" and is located in Locations all over the USA. This item can be shipped to United States, Canada.